Chocolate and zucchini play well together. If the game is hide-n-go-seek, zucchini almost always wins. It stays perfectly hidden under the rich chocolate goodness. We already know this from the many times we have surprised guests with our chocolate zucchini cake. 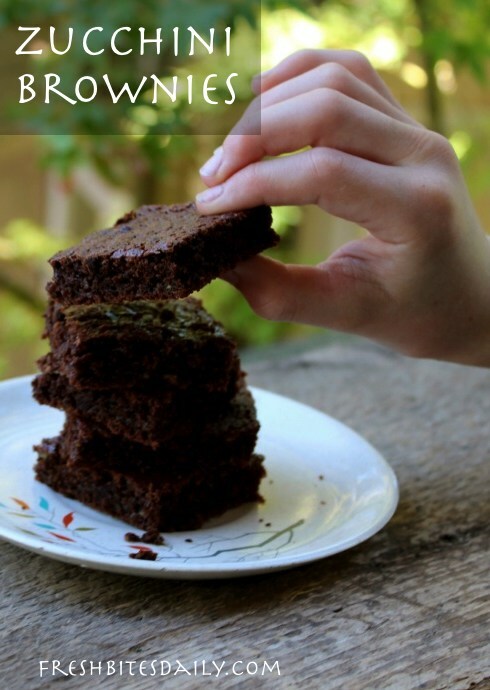 Looking for something more totable than cake, I found this recipe for zucchini brownies. One of the tweaks I made to this recipe is to bake it in a sided cookie sheet to get crisp bars to put in the boys’ lunches. Perfect! It’s also perfect for cutting the bars a little larger and using them as the base for an ice cream dessert. Imagine this chocolate platform topped with a scoop of vanilla ice cream, drizzled with a bit of caramel sauce and topped with a few crushed salted peanuts. That’s a party! If you freeze grated zucchini in two-cup measures as I do, this recipe will get a lot of use in your family year-round. Think of those smiles! The original recipe called for miniature chocolate chips and chopped nuts. I add neither and find these bars quite satisfying on their own. For oil you can use melted butter or coconut oil. While I use lots of coconut oil in my cooking and baking, I prefer the flavor of butter in this recipe. Follow your own taste buds on these issues. The only flour I have used with this recipe is Bob’s Gluten Free Baking Mix. It works splendidly. The original calls for all purpose flour. Again, go with what you’ve got. Place the shredded zucchini in a colander and sprinkle with about 1/4 teaspoon of salt. Toss the zucchini to distribute the salt. Place the colander over a bowl and allow it to sit for 30-60 minutes. Zucchini juice will begin dripping. Use the juice in soup, sauces or a vegetable drink. Send it to the chickens or to the compost. It’s full of vitamins and minerals, so find a suitable place of internment. In the meantime, measure the flour, baking powder, and cocoa into a medium sized mixing bowl. Use a wire wisk or pastry blender to mix the ingredients thoroughly. In another bowl mix the butter, sugar, egg, and vanilla. Blend well. Squeeze the zucchini to remove all the liquid possible then blend it in with the wet ingredients. Sprinkle the dry ingredients over the zucchini mixture and gently blend until all the flour is absorbed. Do not over mix. To do so risks your baked goods being tough. Pour the batter into a well greased baking container, either a 9×13 pan or a small cookie sheet with sides. Spread the batter out evenly using a rubber spatula. Bake in a 350 degree oven for 20-30 minutes. The larger the pan, the more quickly the batter will bake. The top should be crusty and the bottom unburned…like most baked goods. 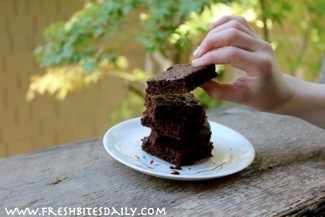 Remove the zucchini brownies from the oven and allow them to cool for about 20 minutes before scoring them into bars. Cool them for another 10 minutes and loosen the bars from the pan. If you wait too long, the bars may break in inconvenient places. In other words, you could end up with pieces instead of bars…an avoidable inconvenience. Either way: delish!